I have thoroughly enjoyed working on this custom quilt this week, everything about it seemed to flow. The fabrics all worked so well together, the linen pieced without frustration, and even the quilting was relaxing (there's a first!). The back of the quilt is also pieced and compliments the quilt top. Most of the fabrics used are also featured in the front of the quilt. 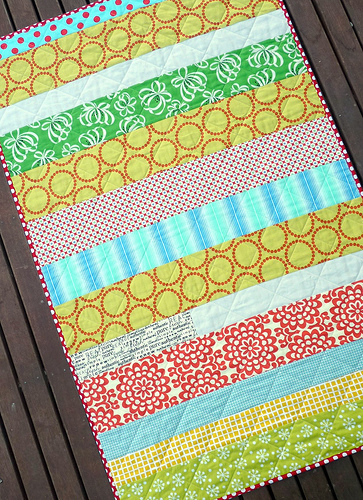 I would even go as far as to suggest this quilt is fully reversible, I really love the back! The binding fabric was suggested by my customer Jenn, and frames the quilt well. It is a really vibrant red fabric and contrast so well with the linen/cotton blend used in quilt top. The binding fabric arrived from the US just as I was finishing the last of the quilting. (This is not pre-made binding). The red binding fabric with white polka dots is Michael Miller - Minnie Ta Dot purchased from MaterialGal on Etsy. Even the mitered corners behaved as they should. Machine stitching the binding is now standard practice, and has become a process that I enjoy rather than dread. This quilt is destined for an adopted baby boy or girl, and Jenn I pray that all your dreams come true soon. It has been a pleasure to work with you, and hope to have been true to your vision. What a gorgeous quilt .... front and second front!! I'm sure Jenn will be very pleased with this quilt, a great job Rita. Rita - the quilt came out beautifully! One of my favorites! Rita, this is so beautiful. Front, and as Andi said, second front. 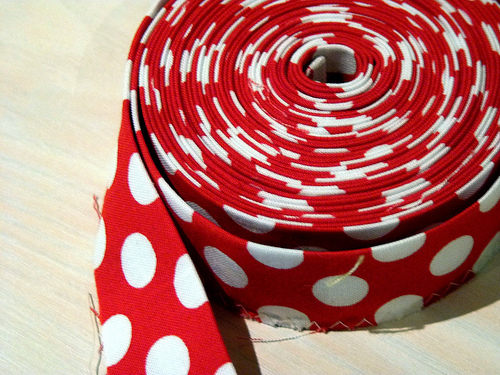 and you can never go wrong with red and white polka dot binding! Which is the front? I love both sides, it is a beautiful reversible quilt - great job. Another great quilt, Rita - it will be so loved! Thanks for the link re premade bindong - one day I must try the machine sewn binding - have you ever done a tutorial? I'm feeling a bit out of the loop these days! That was quick! And I love it. I'm working on a rather big one, right now, and look forward to a smaller quilt, and I love your classic yet modern design. The fabrics are great, too. As always, your work is wonderful and the colors are inspiring! 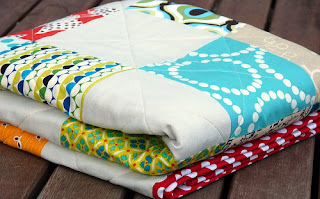 Speaking of inspiration: I think I'm going to try a pieced back one day soon! Just love the quilt! The red binding was a stroke of genius. Love how it frames it up. I am sure their new baby will get lots of use from this lovely quilt. wonderful colorful quilt!! I love the binding - it compliments the quilt so well. Yum! 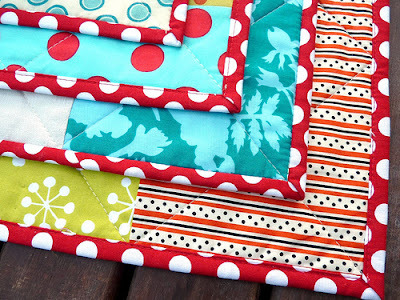 I love how this simple piecing shows off the gorgeous fabrics you've used. What a fun and beautiful quilt! Love the binding! 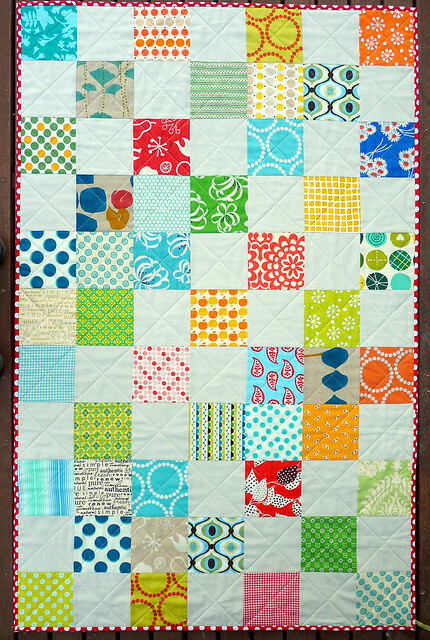 What a bright, happy quilt! I love everything about it -- especially the binding! I can just see that wrapped around a sweet new baby! I love the back too! And what a great quilt for a little one about to join a new family...it's a gift filled with love. That binding fabric is great. Love that quilt! I have been hearing so many stories of adoption recently and it really makes my heart so glad. I too, pray that all of those adoption dreams come true soon. A striking colour mix! Sweet quilt- hope it is well loved. I love the dotty red binding! Beautiful, neutral and gorgeous cot quilt. Oh, this is such a lovely, lovely quilt! And congrats to Jenn on their new family addition!! Colors, Design, Binding --- it is a great quilt! She will enjoy it. Rita: I can't get over how perfect it is--thank you so much!